And if what we're doing here, moving the decimal point back and forth, if this is something that is not familiar to you, I highly recommend watch the Multiples of Ten video before you watch the rest of this video. Because the rest of this video is not going to make much sense if you don't understand how to multiply and divide by 100, and move the decimal place around. Here, we're, we're doing the opposite, un-dividing by 100, which is essentially multiplying by 100. Thus, we move the decimal point two places to the right. We have several decimals here. We're gonna move two places to the right. Notice that the final one, if we have a decimal greater than 1, it becomes a percent greater than 100%. Changing from percents to fractions. This is easy. We just have to put the percent over 100. After that, we may have to simplify a little bit. So, for example, 20%. That''s 20 over 100 which is one fifth. So again, if you're not familiar with that particular video and those concepts are not familiar, please watch that and then come back and watch the rest of this video cuz this video is not gonna make a whole lot of sense if you don't know those conversions. Here we have some fractions. We want to change these to percents. 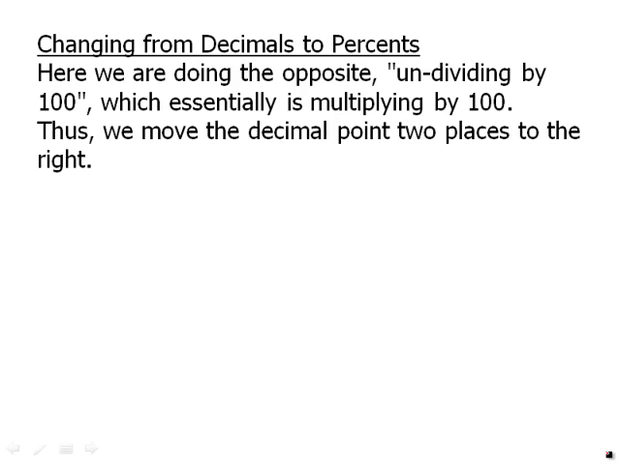 In order to change them to percents, first we're going to change them to decimals, and we know that we can approximate three-eighths as 0.375. We can approximate two-thirds as 0.666 repeating. We'll write it here as 0.6667. Once we have them in decimal form, we just slide the decimal place two places over to get a percent. Of course, for fractions with 100 or 1000 in the denominator, it's very easy to change to a decimal, which would give us a percent. So, for example, 59 over 100. Well, that obviously just becomes 59%. 17 over ten, over 1,000. That becomes 0.017 and we can write that as 1.7%. Those recommendation are for exact conversions from fractions to decimals. Often on the test, we need to approximate percents, from fractions or from division. So, for example, 8 over 33. Suppose we multiply the numerator and the denominator by 3, then we'd get 24 over 99. Well, 24 over 99 is going to be slightly larger than 24 over 100. Of course, when we make the denominator larger, we make the fraction a little bit smaller. 24 over 100, of course, is 24%, so 8 over 33 is gonna be slightly larger than 24%. That's a very good approximation. 11 over 14. Here we can multiply the numerator and denominator by 7, and we'll get 77 over 98. And, of course, that's gonna be slightly larger than 77 over 100, which is 77%. So 11 over 14 is gonna be something slightly larger than 77%. That's also an excellent approximation. So in summary, we talked about what a percent is, we talked about changing between percents and decimals, changing back and forth.